Living a life of devoted painter in India, S. P. Jayakar was a part of the largest commune of Cholamandal Artists’ Village which was credited with introducing the Modernism into the South Indian art. Deeply influenced by their leader and prime visionary K. C. S. Paniker, he joined their circle that was comprised of creative people who have chosen to live and work in peace. He was one of the twenty residents, painters, and sculptors that pooled their skills and organized exhibitions, earning for living by selling their handicrafts. 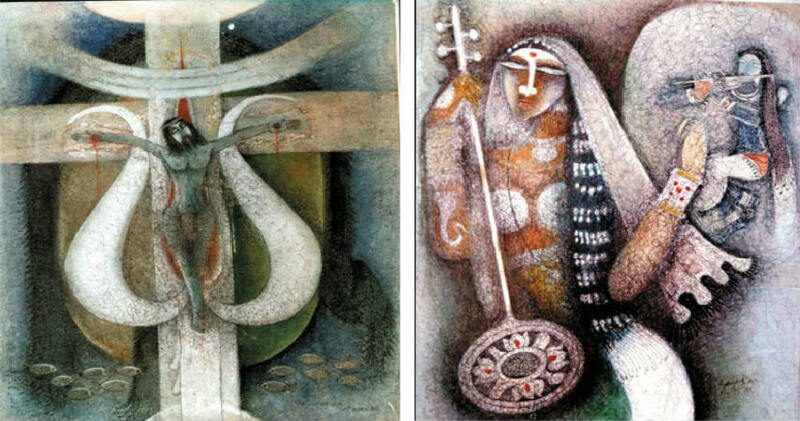 The artist was born in 1931, in Tamil Nadu. In 1951, he earned a First Class diploma in Fine Arts. Due to the money problems, he became a teacher and later moved on to a position with the government. The milestone of his career was the year 1966 when he decided to join the group at Cholamandal Artists’ Village that was credited for the Madras Movement of art (1950 – 1980). They were located in the village Injambakkam, near Chennai and their spiritual leader, K. C. S. Paniker, a great inspiration for all of them, was a noted metaphysical and abstract painter. He deeply influenced Jayakar’s style that was a distinctive mixture of Christian and Hindu elements with plenty of symbols that emphasize his devotion to the Indian tradition. His sophisticated human forms resemble the Ajanta murals, Tanjore wall paintings and rough faceted faces of Jain miniatures. 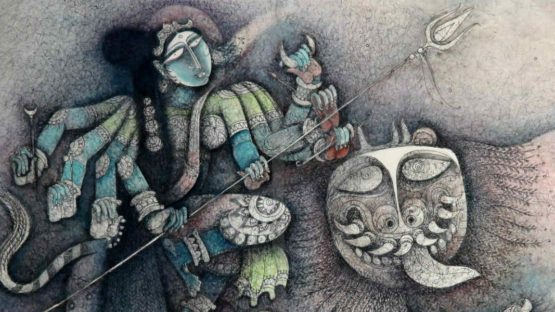 Adopting the Western techniques, the artist increases the beauty of traditionally defined forms that belong to the Indian visual language for more than two thousand years. The artist was also a co-founder of the 40 Artists of Madras, assisted by The British Council in Chennai and many other organizations that had the aim to share his learnings. The artist died in 2005. As a multi-awarded winning artist, he was the recipient of Tamil Nadu State Lalit Kala Academy Award, Chennai, and AIFACS Award among the others. Always ready to help the others, he enjoyed in participation in numerous workshops and art events all over Idia, showing his work as part of several humanitarian exhibitions sponsored by UNICEF, New Delhi.